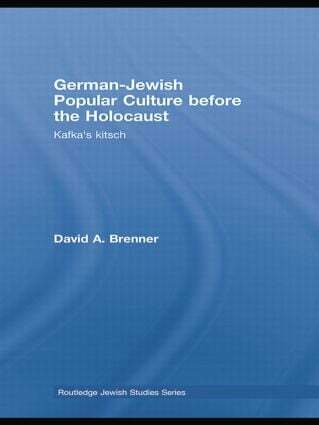 David A. Brenner examines how Jews in Central Europe developed one of the first "ethnic" or "minority" cultures in modernity. Not exclusively "German" or "Jewish," the experiences of German-speaking Jewry in the decades prior to the Third Reich and the Holocaust were also negotiated in encounters with popular culture, particularly the novel, the drama and mass media. Despite recent scholarship, the misconception persists that Jewish Germans were bent on assimilation. Although subject to compulsion, they did not become solely "German," much less "European." Yet their behavior and values were by no means exclusively "Jewish," as the Nazis or other anti-Semites would have it. Rather, the German Jews achieved a peculiar synthesis between 1890 and 1933, developing a culture that was not only "middle-class" but also "ethnic." In particular, they reinvented Judaic traditions by way of a hybridized culture. Based on research in German, Israeli and American archives, German-Jewish Popular Culture before the Holocaust addresses many of the genres in which a specifically German-Jewish identity was performed, from the Yiddish theatre and Zionist humour all the way to sensationalist memoirs and Kafka’s own kitsch. This middle-class ethnic identity encompassed and went beyond religious confession and identity politics. In focusing principally on German-Jewish popular culture, this groundbreaking book introduces the beginnings of "ethnicity" as we know it and live it today.